Nina Hole and her team of Assistants including Mr Craig Hartenberger on the right. Craig Hartenberger (b. 1990, USA) is an artist who uses clay as his primary sculptural medium. Hartenberger’s work has been exhibited in a variety of exhibitions in the USA, Mexico, Denmark, Taiwan, and Australia as well as others and is in public collections in Denmark, Germany, Latvia, and Slovenia. From 2012 to 2016 Hartenberger worked as an assistant to the late Danish artist Nina Hole while building her large-scale fire sculptures. 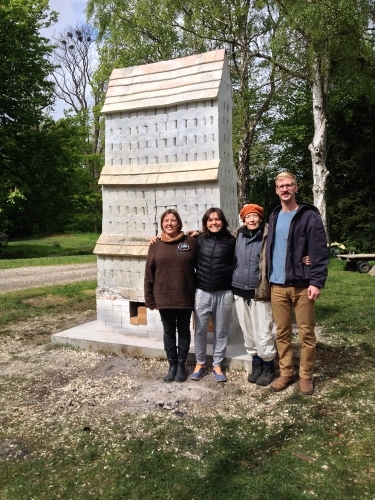 Hartenberger worked with Hole and her team to build five sculptures during this time and now serves as representative for her estate.